Everything web today means everything web and mobile. But it’s a fierce debate about what is considered the right approach for publishing on a mobile platform. Responsive or specific, you’ll find arguments both for and against each cause. 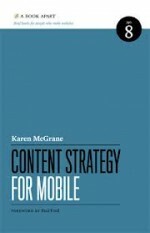 In Content Strategy for Mobile Karen McGrane says that in whatever approach you take what matters is focusing on an adaptive strategy for delivering content. Adaptive content is still about writing good content. But by structuring it within a content model, you can apply the appropriate source to the appropriate device. Little did I know in early 2012 that we were helping one of our clients move in that very direction. Since 2008, the Tourist Office of Saint Gaudens has been changing the way it meets user needs by implementing the web in all its communication efforts. We’ve had the good fortune to accompany them every step of the way. After building an initial mobile version in 2011, we determined with the client a series of evolutions including updating the discover section. Instead of duplicating the pages to apply a proper view for mobile and web, it was much more efficient to have the content stored in one common place, and use the right models for each device. What was more interesting though was the need to structure the content into manageable parts. So, instead of just dumping the content all in one big zone we divided it all up according to sections. Not only was this a method to dealing with multiple languages, but multiple devices as well. So, we finally had our content centralised in one database, with the possibilty if we wanted to add specific viewing instructions according to the device. I suppose we could have tried to apply a responsive approach, but the site was already running, so it was not our intention to redo everything. To apply this new structure to the general web site and the mobile version required a CMS that could render the content accordingly. Karen devotes chapters to the subject and clearly takes a stand by stating that “if you want to deliver a great experience to mobile users, your CMS has to support it.” Not just a great user experience, but a great “author experience” as Karen calls it. In this situation we were using Automne, an in-house, open-source CMS which was completely rebuilt two years ago with the author experience in mind. While Automne is targeted to small to mid-size international sites, I am pleased to see that our CMS also responds in a very adaptive way, and not just for different languages. Automne by default manages your website pages (the big blobs of text), but has also integrated a modular builder (the chunks), called the polymod. For the St. Gaudens discover section we exploited the polymod by creating section chunks. But we had yet to read Karen’s ebook. So we failed to anticipate the need to integrate into the chunks critical metadata to help decipher what goes with what. Such as creating mobile friendly titles, descriptions, or even different sections if needed without necessarily truncating or adding content, but adapting the content to each particular need. From there we could have then created each discover place in a page that points to the appropriate sections we would want to show. Since we have a specific mobile version, these specially designed pages would simply call the appropriate chunk that we want to show. Beyond the technical questions, we did not thoroughly enough explore the option of adapting content itself. Fortunately for us the content was naturally good, and did not need much revision for the mobile experience. After reading Content Strategy for Mobile, adapting the discover sections (among other areas) is the next logical step. An audit of the content will be worthwhile now that we have new methods with which to work. Karen’s ebook therefore offers an engaging discourse on how content can be excellent on every platform, by taking the time to structure accordingly. Writing for mobile is about writing good content, and it is a great continuation in the content strategy movement. It is important to take the time to think about how to optimize your content according to user needs, not frustrating them with missing content, but rather adapting each piece of content into “usable chunks” that make sense and fits to the device.